Terry Pratchett died in March 2015, and this book, with his name very prominent on the cover, was published six months later. One might have a justified skepticism about how much of the material here was actually written by Pratchett -- doubly so if one remembers Pratchett had been suffering from a rare early-onset form of Alzheimer's disease for the decade before that, and trebly so if one is aware how ancillary books are usually put together for bestselling writers. But, you know, we don't need the author to comb through his books and collate the scattered details of the world he built there. Authors generally are not great at doing that, anyway, and prefer to go on building that world rather than researching what they've already done. That's a job for other people to begin with: dedicated, obsessive people. Fans. You know what I'm saying. But the audience wants to think that the author is telling them the secrets behind the fictional world, and the audience is the one who actually pays money. So a fake non-fiction book will want to seem like it's by the original author, even if it's put together by an Emporium of other people. 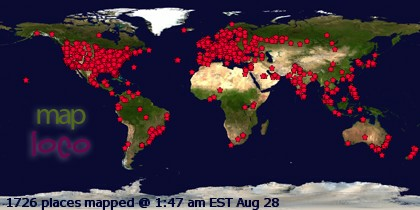 That all brings us here. 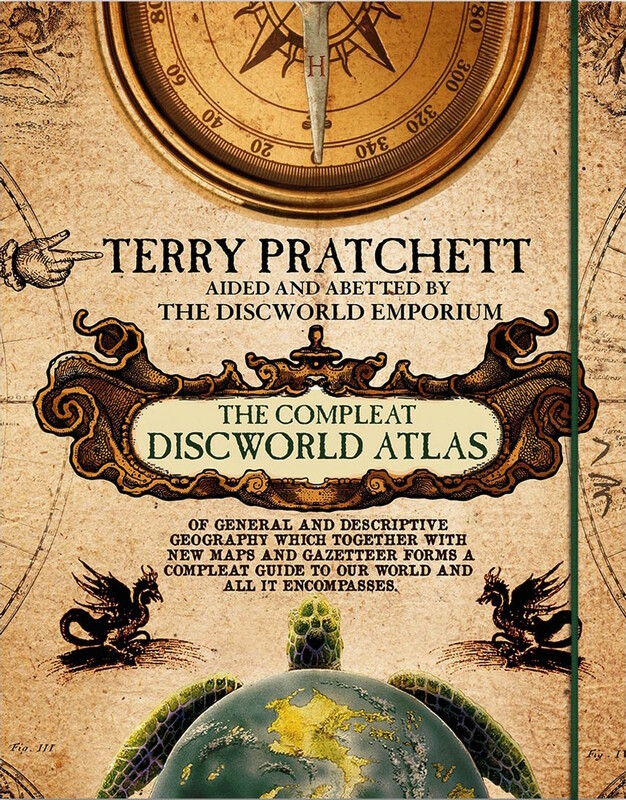 Compleat Discworld Atlas is the successor to the series of individual "mappes" published in the '90s, a major part of the first non-fictional Discworld flourishing, led by the aforementioned Mr. Briggs. The Streets of Ankh-Morpork was first, in 1993, on the grounds that cities will have a definite shape, even if whole worlds can be a bit messy and unclear. But The Discworld Mappe soon followed, and then A Tourist's Guide to Lancre, and, last and least, Death's Domain. Non-fictional Discworld shifted into other avenues -- Nanny Ogg's Cookbook, for example, and a yearly series of desk diaries. But the mapping impulse was apparently still there, and finally burst forth with this full-fledged atlas, in the works at the time of Pratchett's death. Atlas contains both a book and a map, combined in a sturdy heavy-paper cover. The map is quite large: roughly three feet square when entirely unfolded. One side is a clear map of the whole Disc, lightly colored in greens and light browns to show forests and mountains and deserts, with physical and political features labeled and hard-to-see dotted lines to indicate political boundaries. The reverse is a more "traditional" map, with Great A'Tuin below and the gods above -- it's very striking but not meant to be used as an actual map you can find things on. The map is deeply folded to fit into the package, but I'd be surprised if flat, rolled versions weren't also available for those who need to have the Discworld on their walls. The accompanying book covers the lands of the Disc in roughly descending order of how much we know about them, starting with the Circle Sea (particularly Ankh-Morpork) and expanding outward from there in a sequence that doesn't quite follow any particular geographic rules. Generally each section starts off with a colored political map, so we can see where the borders are, but it omits those a couple of times for no obvious reason. There's also a lot of art in this book, which is credited in tiny type hidden on the copyright page as "additional illustrations by Peter Dennis." The maps themselves are presumably by some or all of the Emporium, who comprise Isobel Pearson, Rob Voyce, Bernard Pearson, and Ian Mitchell. The roles of the various Emporiumizers are never explicated. But it's a nice package about Discworld, and it was published at just the right time: there won't be any new Discworld novels or other stories unless Rhianna Pratchett relents at some point under the weight of increasingly large cheques dangled in front of her eyes. No one ever needs a fake non-fiction book. But I enjoy them, probably much more than I should, and this is a solid example of the type, only faintly identifiable as a line-expanding product to be sold to bolster a corporate bottom line.